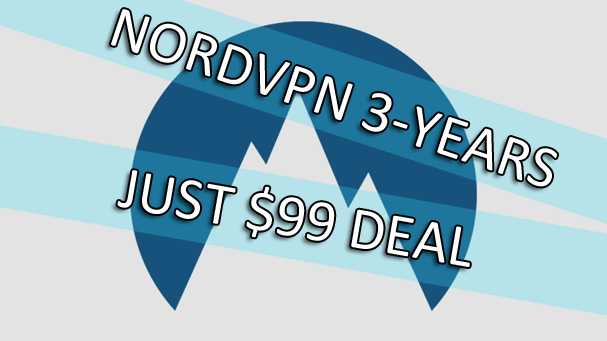 NordVPN have unveiled one of the best VPN deals we’ve seen to date, offering a massive 3 years for just US$99 (~£75). This month sees the annual Black Friday and Cyber Monday sales roll around which is typically the time to empty your wallet and pick up some amazing deals. The VPN industry is no exception and previous years have seen some excellent savings being made available. Unfortunately, these sales are limited to just a handful of days but NordVPN is bucking the trend by offering their latest jaw dropping deal for an entire month. All you need to do to take advantage of the 3 years for US$99 deal is click the special activation link below. The discount code will automatically be applied to your checkout. Don’t delay though because the offer expires on December 7th, 2017. The good news is you’ve got 30-days to cancel your account and get a full refund which is important when you’re locking yourself in for 3 years. Per month the service works out at just $2.75 (approximately £2.08) which is cheaper than any other monthly or yearly deal available anywhere else. In our recent review of NordVPN we found them to offer one of the better services available awarding them 4.4 out of 5 which is one of our highest ever awarded scores. We especially liked their selection of servers which are available in more than 61 countries and their range of server types such as double-hop, P2P and more. Apps are available for both Android and iOS devices and Windows and Mac systems making connection not only quick but easy to achieve. NordVPN stores no logs of what you do while connected to their service so the websites you access and the files you download remain private and no one else will know what you’re doing while using the service. Remember, you can save yourself up to 77% off the standard price by taking advantage of this deal. Just click the link below to activate the deal.